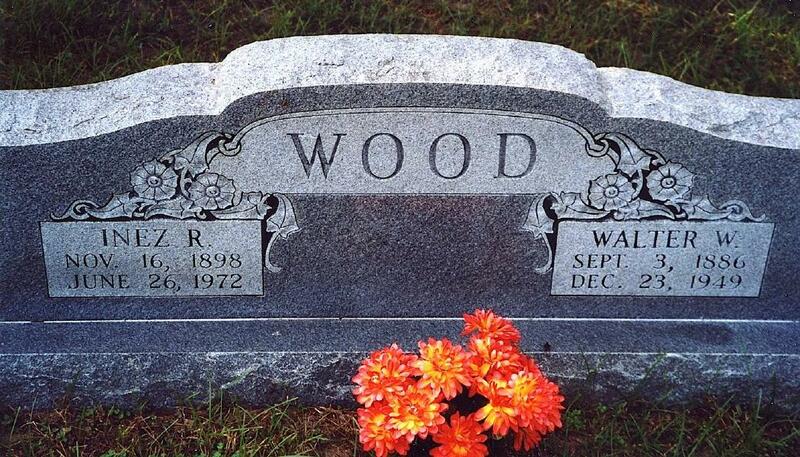 Walter Warren Wood was born on 3 September 1886 in Dolph, Walker County, Texas. Solomon William Wood and Martha Clarana Reed appeared in the US federal census of 1 June 1900 in Anderson, Grimes County, Texas. Other members of the household included Walter Warren Wood, Rush Brevard Wood, Henry Campbell Wood, Homer LeGrand Wood, Ella Lynn Wood, Solomon William Wood Jr. and Elizabeth B. Hurst. It is worthy of note that birth information for the entire family is extraordinarily inaccurate. He was working on the farm, according to the 1900 census. He married Agnes Teague, daughter of John D. Teague and Mary Thomas Whitfield, on 26 April 1908 in Grimes County, Texas. Walter Warren Wood and Agnes Teague appeared in the US federal census of 15 April 1910 in Grimes County, Texas, enumerated next to Agnes' sister Carrie Garner. He was a farmer, according to the 1910 census. An early photographic portrait was made of little Billie Wood. Agnes Teague Wood Ward died in 1917 with two babies. Walter Warren Wood registered for the draft circa May 1918 in Grimes County, Texas, while living in Richards and employed as a concrete man by Magnolia Petroleum Company, Dallas. He began military service on 25 May 1918 inducted into the US Army at Navasota, Grimes County, Texas, trained at Camp Travis, Texas, AEF France 39, Co. 165 Depot Brigade; transferred 16 September 1918 to Co. L, 154th Infantry; transferred 11 December 1918 to Co. L, 162nd Infantry; and 10 April 1918 to 103rd Infantry. 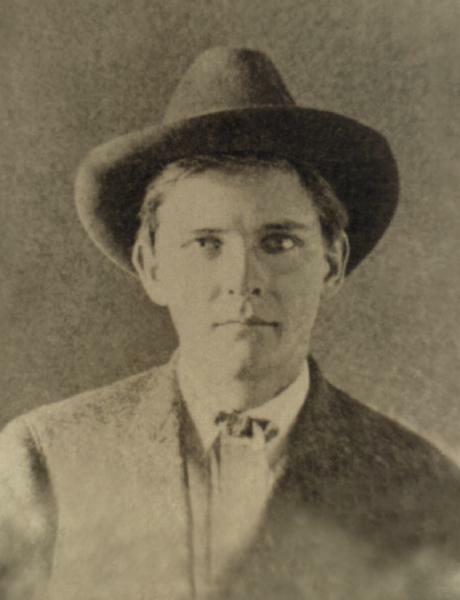 He ended military service on 5 April 1919 at Camp Bowie, Brownwood, Brown County, Texas, honorably discharged. Rush Brevard Wood and Claudia Gertrude Bay appeared in the US federal census of 1 January 1920 in Richards, Grimes County, Texas. Other members of the household included Walter Warren Wood, William Boyd Wood, Solomon William Wood, Martha Clarana Reed, Henry Campbell Wood, Claude Irvin Wood and Myrtle Ernestine Bay. He was an oil pipeline worker, according to the census in January 1920. Walter Wood has not yet been found in the 1930 census. 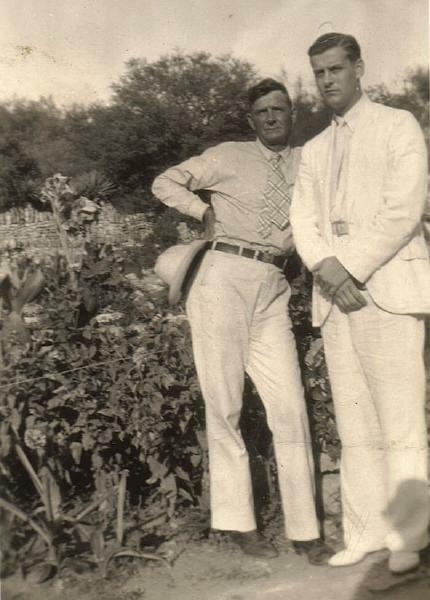 Walter Wood was photographed with his son Billie during the early 1930s at the sunken gardens in San Antonio. 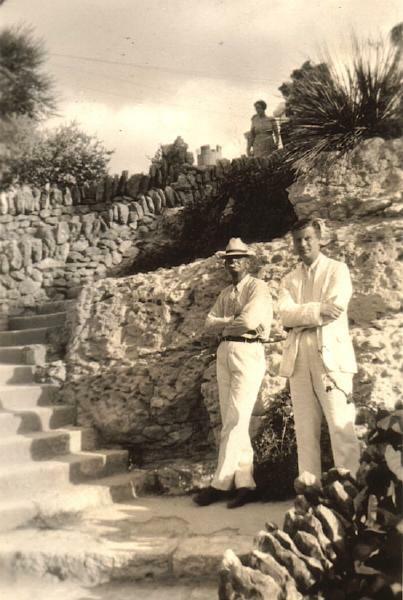 Walter Wood and son Billie were photographed during the early 1930, possibly at the Lawhon residence. 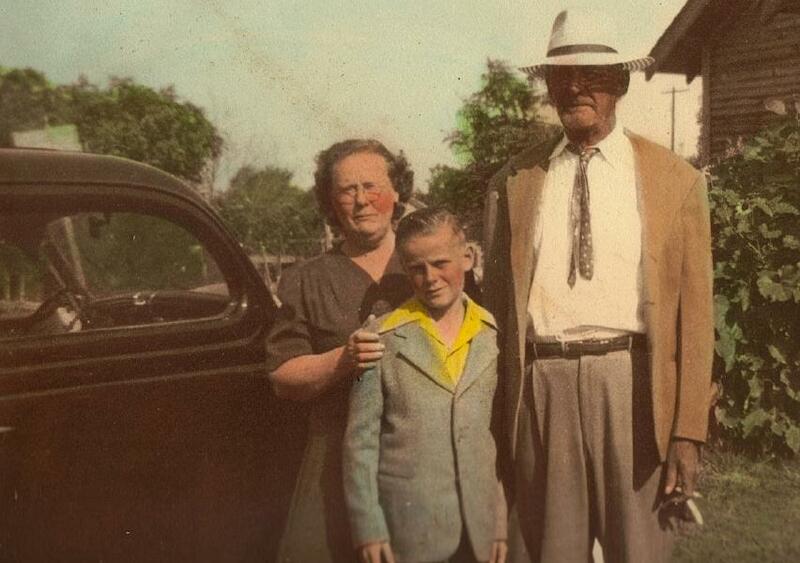 He married Exa Inez Rembert, daughter of William Erasmus Rembert and Sarah C. Leonard, on 15 July 1934 in Grimes County, Texas, with H. A. Bennett officiating. Walter, Inez, and Warren Wood were photographed about 1940. Walter Warren Wood and Exa Inez Rembert appeared in the US federal census of 1 April 1940 in Richards, Grimes County, Texas. 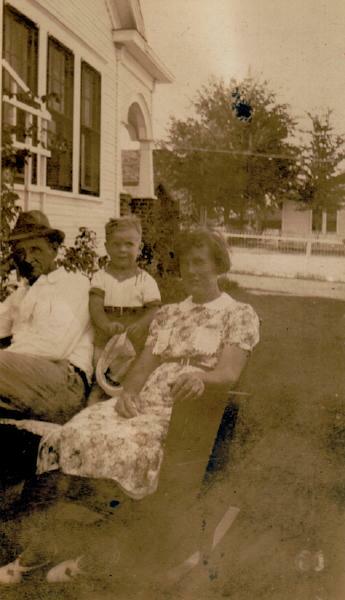 Other members of the household included Roland Lemuel Smith Jr. Also in the household was son Warren (age 3). He was a farm laborer, according to the 1940 census. Walter Warren Wood registered for the draft on 27 April 1942 in Grimes County, Texas, while unemployed and living with his wife in Richards. Inez, Walter, and Warren Wood were photographed about 1947. 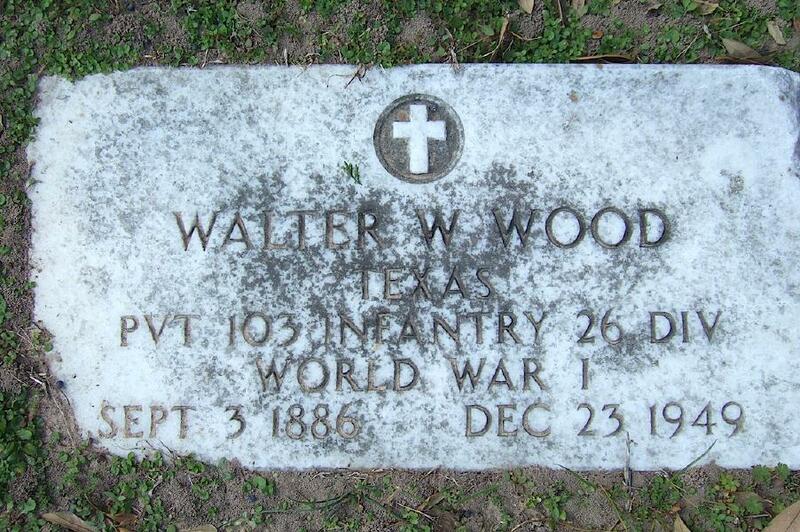 Walter Warren Wood died on 23 December 1949 at age 63 in Richards, Grimes County, Texas, . His death was officially witnessed by Thomas Jefferson Haynie. His wife Exa Inez Rembert became a widow at his death. The following appeared on 29 December 1949 in the Navasota Examiner: Walter Warren Wood, 63, died suddenly of heart attack at 12:10 p.m. Friday, December 23, at his residence in Richards. He was born at Phelps, Walker county, but had resided in Richards since childhood. He was a veteran of World War I. Surviving are his widow, Mrs. Inez Rembert Wood; two sons, Warren Wood of Richards and W. B. Wood of Montgomery, Alabama; three sisters, Mrs. C. B. Easley and Mrs. Ira Haynie of Richards, and Mrs. A. N. Cecil of Houston; three brothers, William Wood of Navasota; Campbell Wood of California, and Homer Wood of Memphis, Tenn; and two grandchildren. Services were held at the Richards Baptist Church at 3 p.m. Sunday, December 25, with the Rev. J. E. Jones, pastor, officiating. Interment was in the Fairview Cemetery near Richards under the direction of Lindley Funeral Home. Pallbearers were T. J. Haynie, H. C. Wood, R. C. Easley, R. L. Smith, B. R. Smith and A. N. Cecil, Jr.
A single grave marker identifies the graves of Walter Warren Wood and Exa Inez Rembert.